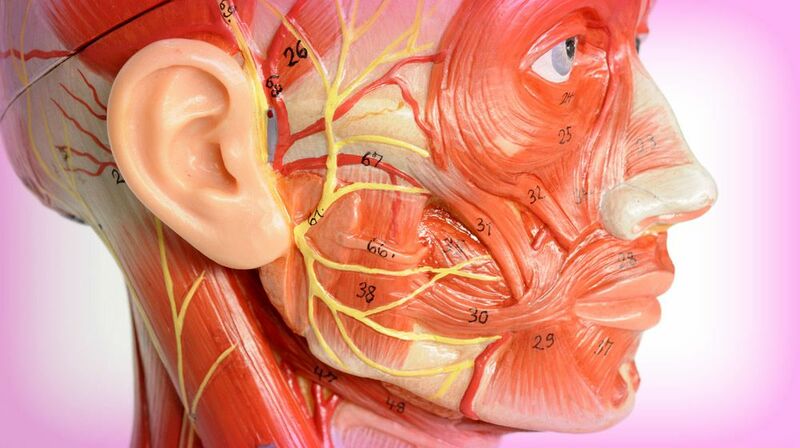 The facial nerve is perhaps the most important nerve system when it comes to function. The facial nerve is responsible for all movement of the face. A damaged nerve at the origin in the brainstem leads to paralysis of the entire left or right side of the face. Find out more about the causes, symptoms, and treatments for facial nerve disorders. What are the Symptoms of Facial Nerve Trauma? What are the Causes of Facial Nerve Trauma? While the facial nerve is usually considered a motor (movement) nerve, it also has sensory components. It originates in the human brainstem at the front of the pontomedullary junction. It travels through the facial canal and sends branches throughout the face. Its main job is to supply nerves to the muscles of facial expression. It also supplies nerve function to the lacrimal gland and the mucus-secreting glands of the nasal cavity and oral cavity. There is a parasympathetic part of the facial nerve, which is also part of the nerve controlling the tongue. The submandibular glands and the sublingual glands do not function well without innervation by the facial nerve. The sensory part of the facial cranial nerve delivers sensation to the external auditory canal, a small patch of skin behind the ear and the surface of the tympanic membrane. Even some taste buds owe their innervation to the facial nerve which is also called cranial nerve VII. Damage to the facial nerve can result in a distorted appearance to your face. You can have difficulty making a certain facial expression or problems closing your eyes. The facial muscles will often sag or droop so your face feels stiff. 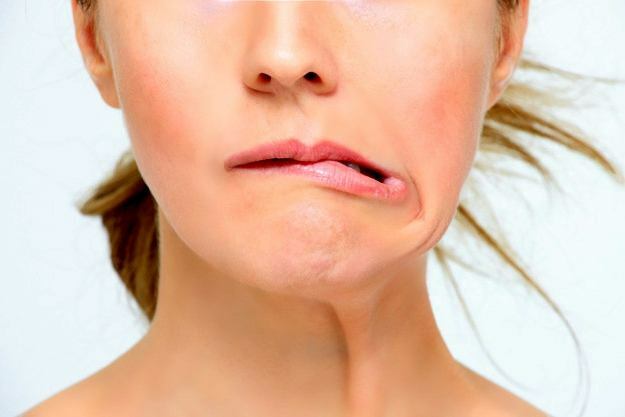 Your face can be completely paralyzed on one side, similar to what is seen in Bell’s Palsy. You lose all voluntary control of half of your facial muscles, and you will have problems keeping food in your mouth while you are chewing. There will be a sensory loss in certain areas of the face which will feel numb. The facial nerve affects your ability to produce saliva and taste food. Damage to the facial nerve can cause taste to be altered. Food and beverages will taste strange or very bland. Some patients with facial nerve trauma will have no sense of taste at all. These changes can be permanent or temporary, depending on the nature of the trauma to the facial nerve. Hearing changes can be a part of the damage to the facial nerve. One of your ears can hear things abnormally loud which can lead to a severe headache. The condition called hyperacusis can be extremely uncomfortable. Because the facial nerve affects sensation behind the ear, there can be pain and discomfort behind the affected ear. If the damage to the facial nerve involves a crash injury or partial laceration of the nerve, there may be a spontaneous resolution of the function of the nerve. If the nerve is totally cut, there may be no hope of recovering the function. A nervous system problem can do damage to the facial nerve in the same way other nerves of the body are affected. For example, if a person has a stroke involving the brain stem, they may have unilateral or bilateral loss of function of the complete seventh cranial nerve. Swallowing and chewing may be difficult if the stroke is large enough. It is a crucial area to lose because of a stroke. Infections of the face or ear can damage the facial nerve. One such infection is herpes zoster or shingles. Shingles involve having the chicken pox infection just along a single nerve. It often yields severe pain, followed by numbness, and pustules on the side of the face which is involved in the infection. When herpes zoster affects the facial nerve, the condition is called Ramsay Hunt syndrome. Toxins can cause damage to the facial nerve like alcohol; the disease happens in chronic alcoholism. Exposure to excessive amounts of carbon monoxide can damage the facial nerve on a temporary basis. Perhaps the most common cause of injury to the facial nerve is called Bell’s Palsy. It is also known as idiopathic facial nerve paralysis. It involves the relatively quick onset of complete facial paralysis and inability to close the eye on one side of the face. It is completely painless but annoying. The loss of function of the seventh cranial nerve lasts about one to two months; however, some people have permanent Bell’s palsy. Some patients are given corticosteroids to block inflammation, and this seems to speed up the healing process in Bell’s Palsy. It is sometimes linked with patients also having diabetes mellitus and in patients who are pregnant at the time of the onset of the disease. Regardless of the cause of the facial nerve disorder, the workup of the seventh cranial nerve involves looking at the face and checking on the symmetry of the muscles of facial expression. The patient needs to raise their eyebrows, close their eyes, smile widely, grimace, and wiggle their nose. These are all just ways of seeing which muscles work and which muscles do not. All the many branches of the seventh cranial nerve need to be assessed. Specialists have certain scales they use to measure the function of the facial nerve. If the main portion of the nerve is involved, the House-Brackmann scale is used, but it is not used when only branches of the nerve are affected. Instead, the doctors subjectively describe the deficits. If there is a deficit at the level of the brainstem, the entire left or right side of the face is affected. If the damage is at the level of the brain, only the lower half of the face is affected because the upper half is innervated by both sides of the brain. It is vital to assess the severity of the injury to the seventh cranial nerve. The more severe the injury, the less likely it is for the patient will recover. There are five different degrees of injury labeled in the Sunderland Classification. First degree injuries almost always recover while fifth degree injuries are likely to have no recovery. The doctor can do an electromyography evaluation or EMG. This records the voluntary and spontaneously-evoked muscle electrical responses. Needles are placed into the various muscles and the electrical responses are recorded. Different types of injuries give off different recordings which can tell the degree of injury. It is a test to help decide the chances of recovery and can show if the nerve is regenerating. Electrical testing can help decide if there will be spontaneous recovery or if there will be surgery necessary. It is used only if there is no sign of facial movement at the time of the evaluation. One test, called the maximal stimulation test, makes use of the “Hilger Monitor.” Two balls are placed on the skin over where the branches of the facial nerve are located. A tiny electrical current is passed between the two balls and the observer sees if there is facial movement. It determines the maximally tolerated electrical current on the normal side of the nerve. The facial movement is decidedly “normal,” “reduced,” “barely perceptible,” or “absent.” People who have at least barely perceptible or absent movement might benefit from undergoing surgical decompression. A test called electroneuronography or ENoG records muscle activity when an electrical stimulus is placed along the skin. It is like an EMG with the exception that it has no needles. If the weak side is only 90 percent of the good side, then surgical intervention is needed. In Ramsay Hunt syndrome, the best “test” is a good history and physical examination. Note that in Ramsay Hunt syndrome, it is important to note that it affects the ear as well as the face and results in hearing loss, taste changes, and vertigo. Blisters will be evident in the ear canal and across the face in places—something unique to Ramsay Hunt syndrome. About ten percent of patients with facial Bell’s Palsy will have family members who have had Bell’s Palsy, too. The incidence of Bell’s Palsy is about 20 people per 100,000 people per year. Men and women get the disease equally; however, pregnant women have a higher rate than non-pregnant women: about 40 cases per 100,000. It is a recurrent disease about 10 percent of the time. People who have had about 3 cases of Bell’s palsy before will have it about 50 percent of the time all over again. With facial nerve damage from any cause, there is often a wait-and-see attitude. The facial nerve, if well approximated on each side at the site of the injury, can gradually regenerate itself so that gradual improvement is expected. Facial nerve damage symptoms, such as dry eye, are treated with lubricating eye drops. An eye patch is used while sleeping because the patient is unable to close his eyes with the facial nerve palsy. With specific types of facial nerve damage, such as Bell’s Palsy and Herpes zoster infections, medications are used. Steroids like prednisone are recommended for Bell’s Palsy to shorten the duration of the illness. In a similar way, antivirals are used to treat Herpes zoster infections. The medications help to reduce the swelling, which is putting pressure on the facial nerve. Leprosy can also cause problems with the facial nerve. If this is the case, steroids are known to result in a 76 percent improvement in facial nerve function. Surgery is recommended in many situations of facial nerve palsy symptoms. If there is a tumor, for example, the tumor can be carefully dissected from the nerve, taking care to keep the nerve branches intact. If the nerve fibers have been transected, surgery to approximate the ends in the hope of spontaneous regeneration is performed. Microsurgery connects the ends of the nerve fibers, and it takes a few months to see if any of the nerve fibers have become reactive. If, on the other hand, the nerve has been compressed by something, surgery to undergo decompression is done. It still takes time to recover the function from this type of surgery. In situations of Bell’s palsy, no surgery has been proven effective. In some cases, new techniques which make use of nerve grafts and tissue transfers are being studied as ways to correct facial nerve injuries. Disfigurement. This is when one side of the face fails to move at all so the face loses its symmetry and the person can’t smile or use muscles of facial expression on one side. There can be changes in taste. Food can permanently taste bland or have an unusual taste to them. The eye can become damaged by being a chronically dry eye. It can get recurrent corneal abrasions, corneal ulcers, or recurrent infections. There can be spasticity or spasm of the facial muscles or eyes. The face can be in a permanently tense position, forming a grimace instead of the usual flaccid facial feature. If you or a loved one has suffered facial nerve damage as a result of someone else's negligence and would like to discuss your legal options with an experienced Sacramento Personal Injury Attorney, contact us online or call us at 916.921.6400 to set up a FREE consultation. Your facial nerve plays an important role in ensuring your quality of living from eating to making facial expressions. If you notice any of these symptoms for facial nerve damage, set an appointment with your physician for a complete diagnosis. The sooner you begin your facial nerve damage recovery time, the higher the chances the symptoms will only be temporary. Editor's Note: This page has been updated for accuracy and relevant.